After several different versions of this bread popped up on blogs that I follow, I decided I HAD to give it a try. And also…BREAD! 😉 I love making yeast bread. Well, let’s just be honest, I love eating it too! #carbloverforlife I’ve made lots of yeast bread over the years, but this was my first try at a no-knead yeast bread. It was so easy – no stand mixer (or elbow grease) required! Stir everything together, let it rise overnight, shape it into a loaf (or loaves), let it rise again, and bake! Easy, peasy. And that crust….PHENOMENAL! 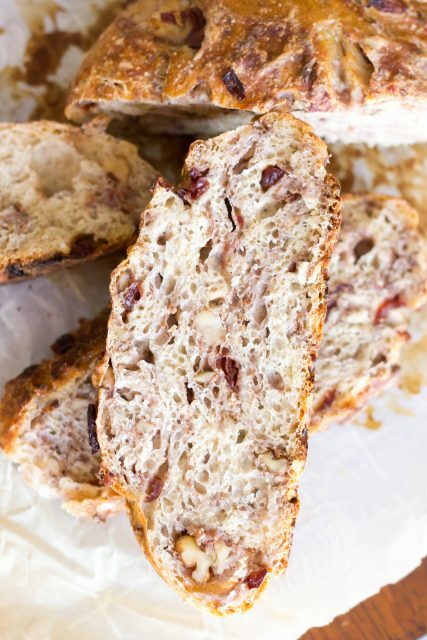 If you love crusty, bakery style breads, you will die over this bread. Well, maybe not literally die, but just go ahead and put on your stretchy pants, okay? =) It’s so good. I froze one of my loaves and I’m planning to make some french toast soon. Pretty sure it will be killer. [Update: I made the french toast and it is GOOD! Recipe – HERE.] 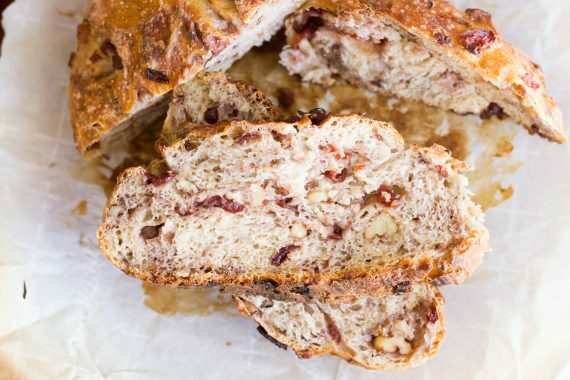 Just go ahead and make this bread today. You won’t be sorry! Enjoy! 1. Mix the flours, salt, yeast, and water in a large bowl. Stir, then use your hands to mix and form a sticky dough. 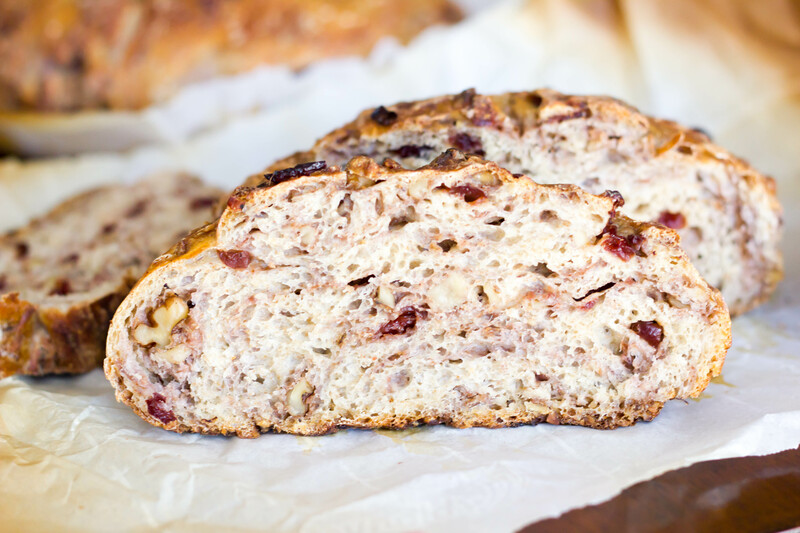 Work the dough just enough to incorporate all the flour, then work in the fruit and nuts. 2. Cover the bowl with plastic wrap, and let it rest at room temperature overnight, or for at least 8 hours; it’ll become bubbly and rise quite a bit, so use a large bowl. 3. Turn the dough out onto a lightly floured surface, and form it into a log or round loaf to fit your 14″ to 15″ long lidded stoneware baker; 9″ x 12″ oval deep casserole dish with cover; or 9″ to 10″ round lidded baking crock (I actually made 2 smaller loaves). Line your dish with parchment paper and spray with nonstick spray. 4. Cover and let rise at room temperature for about 2 hours, until it’s become puffy. It should rise noticeably, but it’s not a real high-riser. 5. Using a sharp knife or lame, slash the bread in a crosshatch pattern. Place the lid on the pan, and put the bread in the cold oven. Set the oven temperature to 450°F. 6. Bake the bread for 45 to 50 minutes, then remove the lid and continue to bake for another 5 to 15 minutes, until it’s deep brown in color, and an instant-read thermometer inserted into the center registers about 205°F. Remove the bread from the oven, turn out onto a rack, and cool before slicing. 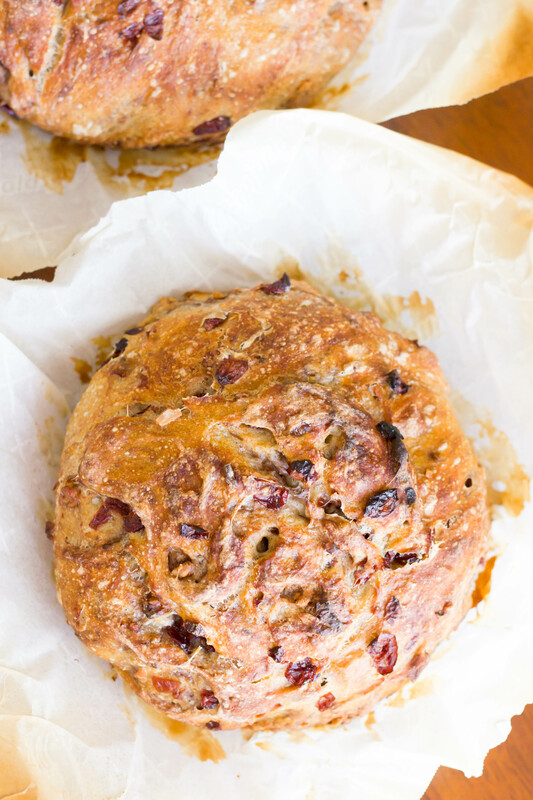 Notes: Wrap leftover bread tightly in a couple layers of plastic wrap. Place in ziploc bag and freeze for later. Makes KILLER french toast – recipe HERE.